John Mayall is a British blues singer and multi-instrumentalist who was a major figure in the 60s British blues scene. At the 60s drew to a close, John Mayall's contract with Decca Records was up. He signed with Polydor, put together a new band and moved to California. With his new band he took a different direction, planning to play low volume music with no drums. The lineup was very interesting - John Almond on flute and saxes, Jon Mark on acoustic fingerstyle guitar and Stephen Thompson on electric bass guitar. Mayall himself sang and played harmonica and electric guitar. There was no drummer or percussionist. The new group debuted their new sound at the 1969 Newport Jazz Festival, and released their first album shortly afterwards. 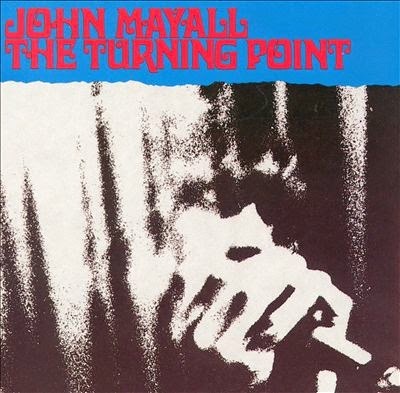 The Turning Point was recorded live at the Fillmore East, and was indeed quite a change for Mayall. It was still blues of course, but a new low-key, rootsy style of blues, with lots of room for jazzy improvisation. This was no doubt very welcome, as the template of loud electric guitar-driven blues was perhaps getting a bit stale after nearly ten years. The album was a definite success artistically, and helped make Mayall very popular in the US as he began to call California home.